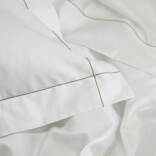 Tremiti is made in Europe from a lusterous Egyptian cotton in a 600 thread count 100% Egyptian cotton sateen. It is perfect for those seeking the luxury and smooth touch of a true sateen. The design comes with a timeless chain stitch detailing perfect for all bedroom decors. The collection launders perfectly becoming softer with every wash.
I´ve been buying Sheridan sheets for years but thought I´d try Deia Living after a friend recommended them. I bought the 600 thread collection and am extremely happy -they´re really soft yet strong, wash well and are so comfortable. Highly recommended.